Plunge into the Great Barrier Reef, Australia’s pristine aquatic ecosystem, for an adventurous honeymoon in the world’s most extensive coral reef. The nation’s greatest natural wonder is comprised of approximately 900 islands, many of them unscathed by urban development and uninhabited. 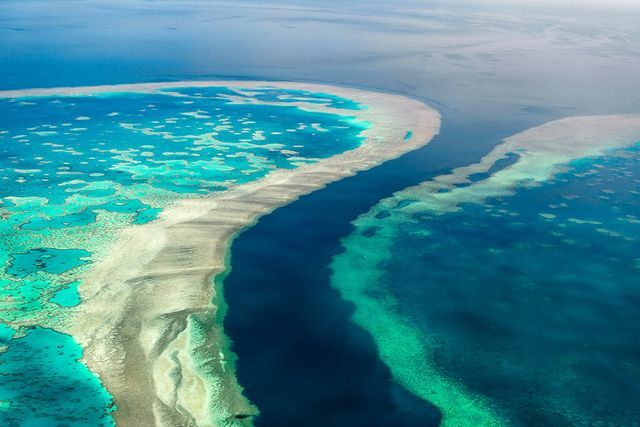 Personal encounters with the rich marine wildlife of the Great Barrier Reef draws a maelstrom of snorkelers and divers to the area annually, while its dense rainforests excite passionate nature lovers. Together with the white sand beaches and calming sea breeze, the Great Barrier Reef promises a heavenly tropical paradise honeymoon experience. Australia’s dry season from November through June coincides with the peak tourist season. These months offer comfortable climate and ideal diving conditions. December through March marks the wet season, and brings about heavy rain and stifling heat. Whitehaven Beach: Blanketed by pure white sand and met at the shorelines by pristine turquoise waters, Whitehaven is a beachgoer’s dream. Tongue Point Lookout: Witness the tides of the aquamarine waters blend seamlessly with the powder white sands to create a stunning natural mosaic at Whitehaven’s Tongue Point Lookout. Hot Air Balloon: Soar over Australia’s greatest natural treasure in a scenic hot air balloon ride, and view sunrise over the boundless Coral Sea. White Water Rafting: Experience the thrills and adrenaline of white water rafting and navigate the mighty Tully River under the instruction of an experienced guide. Snorkel: Immerse in the world’s largest coral reef, and surrender yourself to the mesmerizing beauty of Australia’s rich marine wildlife. Daintree Rainforest: An ancient tropical rainforest believed to be one of the world’s oldest, Daintree is home to uniquely Australian critters and vegetation. Hike through the paths with an expert guide, or zip line through Daintree and marvel at the striking valleys and gentle rivers from above. Turtle Hatchlings: Witness nature’s miracle of life and experience the wonder of turtle hatchlings on Heron Island, home to some 4,000 Green and Loggerhead turtles. Though they can be spotted on Heron year round, nesting season generally occurs between November and March. Tjapukai Aboriginal Cultural Park: Visitors to Tjapukai Aboriginal Cultural Park gain a deeper understanding of Australia’s rich history and indigenous tribes through cultural art and dance performances, as well as an authentic Aboriginal meal. Take Flight: Embark on a scenic helicopter ride, and from above, observe the unmatched beauty of lush green islands engulfed by the glistening blue waters of the Coral Sea. Each moment is picture perfect. Kuranda Koala Gardens: A wildlife sanctuary, Kuranda presents its visitors the opportunity to observe the koala in its natural habitat. Create lasting memories by cuddling a koala and capturing it on film. Esplanade Boardwalk: Unwind with an evening walk along the 3 kilometer Esplanade Boardwalk along the Cairns Esplanade. For visitors, displays along the boardwalk explain the history of Cairns as well as its rich Aboriginal culture. Experience Luxury on Hayman Island: At 400 hectares, this relatively small island boasts a great concentration of resorts. Book yourself in for a relaxing day spa, and spend a romantic evening meandering through the cheerful gardens and gentle waterfalls of Hayman Island.